Simple 3-Step Sales Funnel for Acquiring New Customers - More Traffic. More Leads. More Business. If you’d like more web traffic but you’re not sure about the cost / benefit to your company, here’s how you can run the numbers. 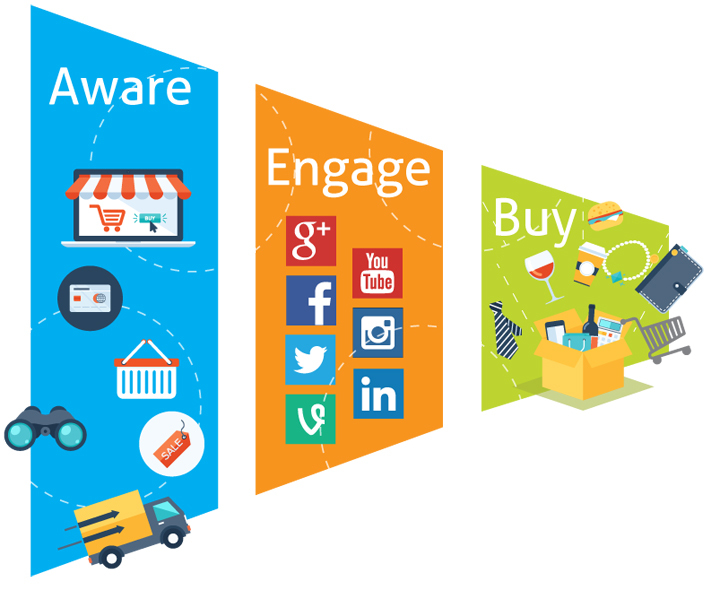 Here is a Basic 3-Step Sales Funnel for new customer acquisition. 1. Aware: how much does it cost to get a new visitor. 2. Engage: what percent of visitors engage with you on your website. 3. Buy: what percent of visitors buy. Let’s find out how much each new customer will cost with SEO marketing. Step One: How Much Are You Willing to Pay for a New Customer? What are you willing to pay to get a new client or customer? If you sell “spectacular all-purpose cooking widgets” for $10, your customer acquisition cost (CAC) might be pennies. However, if you’re a real estate broker selling multi-million dollar properties, your customer acquisition cost could be several thousand dollars. Decide how much a new client or customer is worth to you and go to Step 2. You’re a real estate broker in Los Angeles selling high-end homes for over a $1,000,000. Your commission on that sale is $30,000 so you’re probably willing to spend up to $3,000 to $5,000 to acquire a new customer. Based on an ROI (return on investment) of roughly 8/1 to 10/1, you should be spending between $3,000 to $5,000 to make $30,000+. This is just a hypothetical rule used for our example. All industries have very unique ROIs based on overhead, expenses etc. How much will that new customer cost using SEO? 1. 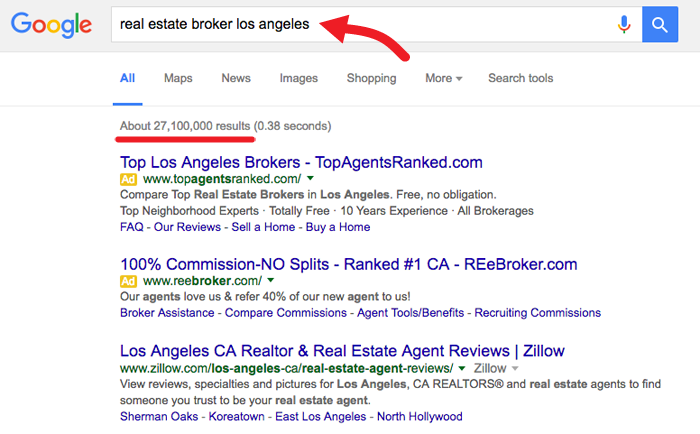 Google your best keyword – “real estate broker Los Angeles”. Google search results: 27,120,000 results for “real estate broker Los Angeles”. This means that your keyword is very, very competitive. 2. Your keyword would cost $5.54 per click if we were paying for AdWords. We are using this number to determine the value of the keyword, we don’t pay Google for keywords. How many visitors (clicks) do you need to get 1 new customer? New visitors: Let’s start with 1,000 new visitors a month. Qualified leads: Statistically, your new visitors should become qualified leads at a rate of between 1/2% to 2%. 1,000 new visitors times 2% is 20 qualified leads. Customers: If you have 20 qualified leads converting into customers at a 10% rate, you should get 2 new customers from 1,000 unique visitors per month. Cost for new one new customer: If we paid $5.54 per new visitor, our new customer would cost $2,770. Customer acquisition cost vs your budget. Review what you’re spending on marketing and how much you’re making on each new customer. If you CAC (customer acquisition cost) is too high you need to revise your marketing strategy or use different marketing methods to drive new, qualified traffic. This is a very easy tool to use to quickly see how your budget stacks up against your CAC. We’d be happy to run the numbers for you; just shoot us your website address, your most important keyword and we’ll get right back to you with the results.